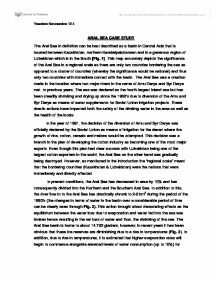 ARAL SEA CASE STUDY The Aral Sea in definition can be best described as a basin in Central Asia that is located between Kazakhstan, northern Karakalpakstansan and in a generous region of Uzbekistan which is in the South [Fig. 1]. This map accurately depicts the significance of the Aral Sea in a regional scale as there are only two countries bordering the sea as opposed to a cluster of countries (whereby the significance would be national) and thus only two countries with immediate contact with the basin. The Aral Sea was a creation made in the location where two major rivers in the name of Amu Darya and Syr Darya met. In previous years, The sea was declared as the fourth largest inland sea but has been steadily shrinking and drying up since the 1960's due to diversion of the Amu and Syr Darya as means of water supplements for Soviet Union irrigation projects. These drastic actions have impacted both the safety of the drinking water in the area as well as the health of the locals. In the year of 1981, the decision of the diversion of Amu and Syr Darya was officially declared by the Soviet Union as means of irrigation for the desert where the growth of rice, cotton, cereals and melons would be attempted. ...read more. As mentioned in the writing above, agricultural demands have deprived this large Central Asian salt lake of enough water to sustain itself, and hence shrunk rapidly. Uzbekistan, Kazakhstan, and other Central Asian areas utilize the water to grow cotton and other export crops as means of boosting economies financially. Not to mention, the transition of originally growing food crops in the area which only needed to be partially irrigated to cotton and rice which need to widely irrigated (resulting in the construction of vast numbers of irrigation canals), increased the stress on the necessity for water in terms of an agricultural perspective. In addition to being extremely beneficial to agricultural uses, the Aral Sea used to provide millions of people with the basic neccesities of life: food in the form of fish and water necessary for basic needs (sanitation, hygiene, hydration e.t.c). Towns bordering the Aral Sea such as the town of Myunak used to be famous for their plentiful and rich fishing industries are now deserted towns (displacing 40 000 fishermen and bringing the fishing industry to a sudden stop) due to the shrinking and the drying up of the sea. One could also argue that the Aral Sea served as a habitat with a large biodiversity: home to marine life as well as to a range of plants. ...read more. kidney problems which are expected to worsen when in relation with rising temperatures due to higher concentrations of contaminants in the water. Thus in conclusion it is evident how human factors such as the exploitation of the water for agricultural purposes and the use of pesticides, toxins and chemicals have led to the destruction of the Aral Sea consequently harming the economies, environment and the lives of many people and organisms. In addition to this, it is also obvious with clarity that certain environmental factors such as the rise in temperatures and the low rainfall have also contributed in the diminishing of the Aral sea. In addition, it is also manifest that the diminishing of the sea has led to dwindling of drinking water supplies in the surrounding nations. In addition to this, even the remaining water in the sea is not classified as safe drinking water due to immense amounts of pesticides, toxins, chemicals and contaminants in the water making it unfit for consumption thus affecting access to safe drinking water. In overall, I strongly believe that the Soviet Union made a grave mistake in diverting the rivers as in the end, as opposed to getting an upper hand on teh benefits of this decision, we are now faced with the severe consequences in the form of human lives, our environment, marine life and in terms of financial means. ...read more. 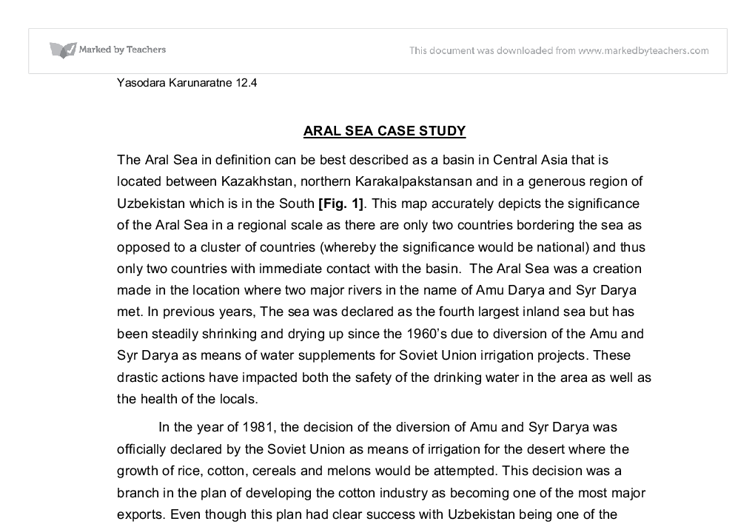 An excellent summary of the Aral Sea case study, using appropriate figures to give evidence. Potential for further use of data in places. In total, 214 thousand square miles, a sheer area larger than France is occupied by cattle ranches in the Brazilian Amazon. (rainforestconservation, N/A) Globalization plays a significant role in cattle ranching because huge international food chains such as McDonalds require mass production of beef in order to satisfy global consumers. Farming in the Amazon There are three types of farming methods used: - "Slash and Burn" - the traditional method used by the natives in the rainforest. Although this method is most sustainable, it also causes significant areas to be cleared, even if only temporary, each year. The foreign direct investment has come in the way of large-scale projects such as luxury hotels and resorts, restaurants, development of local market for shopping to tourists, and so on. This has also helped in growth and development of social culture of that region and social life of people in that region. To what extent are deserts a product of present day processes? Other relic dunes are not even being worked by wind, and were produced in a time during the Holocene period when they were active As the cliffs in deserts are weathering limited, these are a product of present day processes. The air around the Aral sea is very dry. In the summer the humidity by day is less than 25% and my midday it can fall below 10%. In winter the humidity averages to 40 to 65% during the day. It is has also been noticed that many parts of Kazakhstan and Uzbekistan experiences hot, dry winds called the sukhoveya, these winds can cause severe damage to crops. after prolonged rainfall or a storm. External factors that will change infiltration rates include the chemical composition of the water, vegetation cover (e.g. trees) and a high temperature of the climate will increase the infiltration capacity as the evaporated water frees up more space. This consequently increases pressure in the rock, causing pieces of the rock to fall off. Another chemical process that weathers hot desert environments is hydrolysis. This occurs if rocks containing salt minerals allow water to percolate, causing the salt crystals swell in the presence of Water.